Moonstone is a sodium potassium aluminium silicate. It is a feldspar with a pearly and opalescent schiller.The most common moonstone is of the mineral adularia, named for an early mining site near Mt. Adular in Switzerland.Moonstone is composed of two feldspar species, orthoclase and albite. Found through the world. Moonstone is a stone of innergrowth and strength. It soothes emotional instability and stress, and stabilises the emotions, providing calmness. Moonstone enhances intuition, promotes inspiration, success and good fortune in love and business matters. 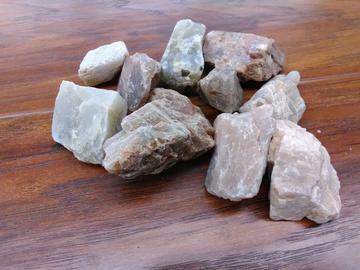 Stone sizes range from 1/2"-3"